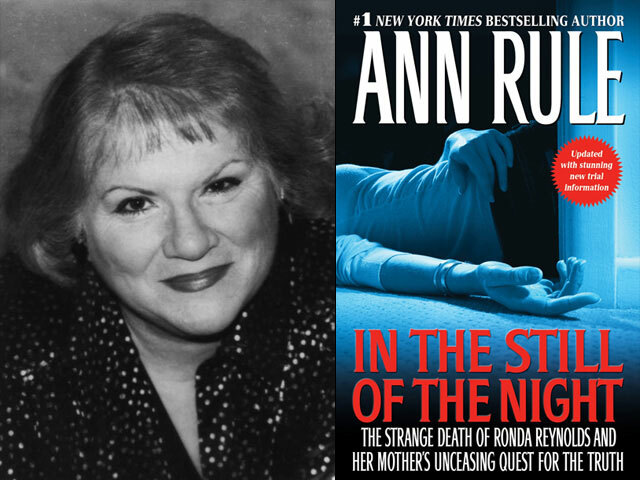 (CBS) Best selling true-crime author Ann Rule has written a book about the Ronda Reynolds case entitled: "In the Still of the Night." She took a few questions from "48 Hours Mystery" producer Susan Mallie. Read the foreword to "In the Still of the Night"
What intrigued you about the Ronda Reynolds case when you first heard of it? I heard about Ronda's death on the radio, and in other media a day after it happened. And I got a "Hinky" feeling - cops' instinct that something isn't right. I remember having that same feeling when Diane Downs was first reported as the grieving mother of three children who had been shot by a "bushy haired stranger." I think it was a few months after that when Barbara Thompson first contacted me and asked if I could write a book about her daughter's case. I told her that I couldn't - because the case wasn't closed yet. I didn't know that more than a decade would go by with no answers to the mystery of the manner of Ronda's death. During that time, Barb probably contacted me about once a year to let me know what was - or mostly was not happening. And I had to keep telling her that I didn't think I could write an unsolved case but to please keep me updated on what was happening in her fight to get some kind of justice for her daughter. Finally, in 2010, I decided that I would write it - even though I knew there was no ending yet, and that there might never be. A coroner's inquest is an unusual legal proceeding - tell us some of your impressions from having attended this one. This was the first coroner's inquest I've gone to in more than 35 years as a true-crime writer. I was shocked to see a definite demarcation between the sheriff's investigators and Barb's supporters. It was as if a fence had been erected down the middle of the courtroom. And I was concerned to see that the prosecutor sat with the detectives and laughed and talked with them so much. He had told us a year earlier that he would do everything he could to follow up the truth of Ronda's death. Only the jurors and persons of "especial interest" were allowed to ask questions - and I wasn't one of them. That was a little frustrating. I had hoped that Ron Reynolds would show up to testify -but he didn't. Only his elderly mother, and his ex-wife, Katie, complied with their subpoenas. Most of the points I felt were important WERE brought out with the coroner's questions, however, and I felt some hope that the jurors would come back with a homicide verdict. I was really surprised when they deliberated some more and named Ron Reynolds and his son, Jonathan, as the likely killers. That was more than I had hoped for. It finally looked as if there would be a trial. The inquest jury ruled that Ronda's death was a homicide - that's also an assertion your book makes. What was your reaction to the verdict? I was happy and relieved, mostly for Barb. Finally, after so many years, a group of people neither she nor I knew, saw the gaping holes in the sheriff's investigations, and the physical evidence that just didn't match Ron's story about when Ronda died. After all the cases I've written, and the many forensic science courses and seminars I've attended over the years, I knew that Ronda's degree of rigor mortis and livor mortis (lividity) among several other things could not be explained away by calling her death a suicide. I have two grown daughters myself, and I can at least begin to empathize with Barb's grief that her daughter was not only gone forever, but that people were saying she was a suicide. This book was one of the most difficult I've ever written, and it continues to reverberate.